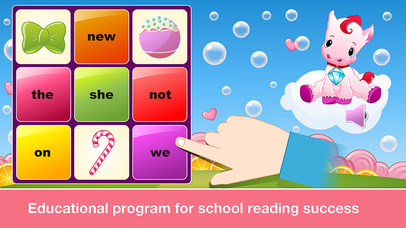 ***** WONDERFULLY EDUCATIONAL NEW READING PROGRAM FOR BEGINNING READERS (AGES 2-7). ***** Developed in cooperation with educational specialists by an award-winning educational studio, 22learn, the creator of the best-selling Sight Words Learning Games and the reading program Phonics: Fun on Farm, to best prepare your children for success in kindergarten and school curriculum. 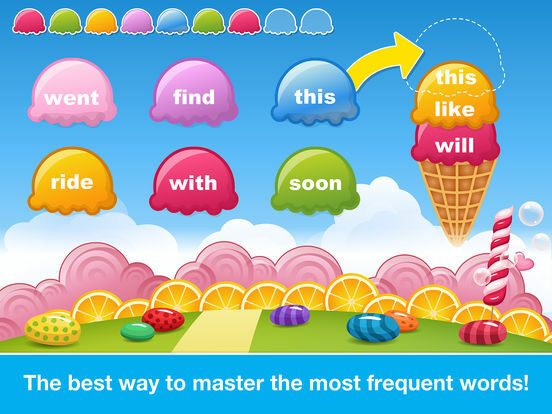 Sight Words Adventure in Candyland helps children learn and practice reading the most common sight words. Sight words are the most frequent words in children’s literature. Many of these words do not have a simple letter-to-sound correspondence, and thus must be learned “by sight”. Mastery of these words can rapidly increase the child’s reading fluency because it eliminates the child’s time-consuming attempts at decoding these high-frequency words. 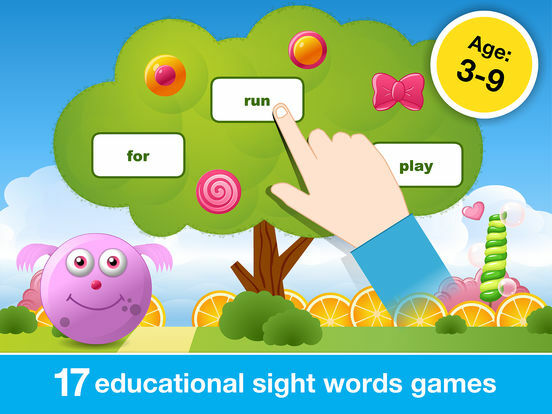 Sight Words Adventure in Candyland features the most commonly taught list of sight words, the Dolch Word List. Originally compiled by Dr. Edward W. Dolch, this list is divided into 5 categories and includes an extra category for nouns. Sight Words offers children an easy-to-use interface and a grand choice of 18 fun educational games through which children can acquire mastery over this subject matter. In Sight Words Adventure in Candyland, Abby the Monkey goes on an adventure in Candyland. Candyland is a fairy-tale land inhabited by cute little pink unicorns, trees full of delicious candy fruit, and chocolate rivers. The unicorns need the learners’ help to grow magical plants that grow on clouds and sustain this land. The learners play educational games to gain gardening supplies and grow the beautiful magical plants. Complete a word recognition challenge! Tap on the words called to ripen the candy fruit. Once all the fruit is ripe for picking, drag the fruit to the hungry little monster to feed it! Can you build an ice cream? Serve the scoops marked with the sight words customers call. Use the candy typewriter to learn to spell sight words. Once all words are typed, celebrate your accomplishments by releasing fireworks. Gingerbread Bubble House trapped sight words in bubbles! Free the sight words by tapping on the bubbles with the words called. Aliens want to go for a ride. Tap on the correct word to reveal an alien. Then drag the alien into its cart. Once all aliens boarded their carts, let the aliens enjoy the ride! The monster is hungry! First, memorize the sight words. Then, tap on the cards with matching words in successive order. You will get a candy for each word match. Don’t forget to feed the monster with the obtained cookies once you’re done! The monkey wants to fly with her plane but first she needs to open the gates. Help the monkey open the gate by tapping on the word called. Are you beginning speller? Build your knowledge with Spelling Airship. In comparison to Spelling Challenge, Spelling Airship provides all the letters you need to spell the word. Your task is to drag the letters onto the airship in the correct order to spell the word called. The monkey cannot fly through heavy clouds. Clear the sky from the clouds by tapping on the clouds marked with the words called. Once the clouds are gone, drag the plane along the rainbow path to navigate the plane. Have fun decorating cupcakes with toppings! Your task is to match the correct toppings to the correct cupcakes. To find out to which cupcakes the toppings belong, tap on the speaker icons.